The high on gold on the AM London Fixing was $850 back in 1980. However, when we index this to the government CPI adjusting it for inflation, the 1980 high corresponds to a price of $2,305.18 in 2011 dollars. This is a far more important number than all the nonsense of fiat and hyperinflation. Gold in “real” terms has NOT exceeded the 1980 high yet even today. A 911 Porsche in 1980 was only about $50,000. So you are not there yet. For gold to back off, shake the weak players out of the trees, is a necessary and healthy thing that MUST take place to rejuvenate the market for the next blast to REAL highs. 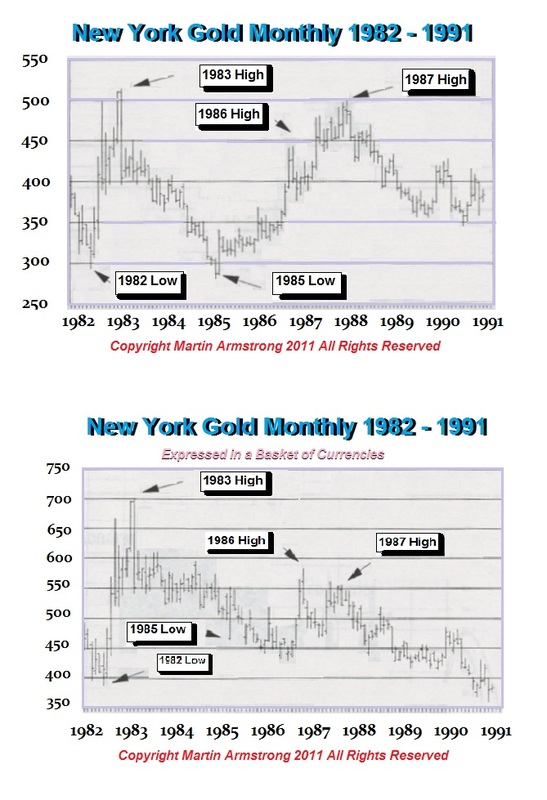 Even when there was a gold standard, inflation rises and falls and then gold moves opposite declining with inflation as assets rise against gold, and it rises in value during deflation as the dollar does today. There is NEVER a period when anything is ever fixed forever. Even behind the Berlin Wall there was a black market for West Germany marks and dollars. This is the problem most people have. When I say there is sizable resistance in the 2300 level technically, this is actually supported by the real fundamental view from an inflationary perspective. Likewise, looking at gold only in dollars FAILS to grasp its true trend. Gold may decline as the dollar rises currently, but is it declining in terms of yen and euro? Everyone acts according to their own currency. If I recommend buying something in Mexico because it will double in peso terms but omit that the peso will decline by 75%, in dollars you will lose your shirt. Some rant and rave and call me a gold basher. Here is a chart of gold they hated, when we forecast new lows would be made. In a basket of currencies, gold was really declining meaning foreigners would be sellers whenever Americans were buyers. For a REAL bull market, the object must RISE in terms of ALL currencies, not just the local one. Sorry, those who are trying to make sure nobody listens to me either (1) have such a myopic view of the world it is scary, or (2) have some sort of vested interest in preventing people from ever taking a profit in gold. A REAL analyst NEVER says only buy – that is a salesman. If gold does not constantly go up, it is a plot of some dark force for otherwise they would be right. STOP blaming everyone else for your failure to grasp the global economy. This is about MAKING money – not donating it to the banks who will sell based upon the technicals. Gold will rally. But that will NOT be until Europe and Japan melts down. Look for the real rally after 2015.75.